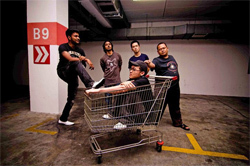 Here's a promising young band from Malaysia, Dulcinea, and their second album, In the Shadow of the Sun. The band is named after Don Quixote's imaginary lady in waiting. But unlike Quixote's farcical journey, this band is not chasing after musical windmills. Dulcinea: Rocinante in wire and four wheels. The general context of In the Shadow of the Sun is something between progressive rock and metal, with nuances to more modern and alternative rock. Early, within Silent Reign and Vertigo, those prog elements arise. Following the pleasant instrumental, Koyaanisqatsi, Dulcinea delivers two songs subdue the complexity for more heavier, groovy, modern rock. Saturn Return also turns on this, but also ups the intrigue. What's quite remarkable is flow, or congruity, of this album. The pace is well-developed and the songs, while varied, blend with a hypnotic consistency. Expecting a big finish, the album ends with Closure, a curious sublime piece of melodic prog rock, only near the end does it rise up in a moderate crescendo. But it still fits. It's easy to recommend Dulcinea's In the Shadow of the Sun as it's fine melodic progressive rock, with some metal edge. The band shows great talent and creativity throughout this work. Get it, if you can find it. 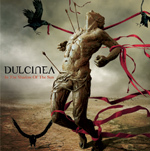 It's easy to recommend Dulcinea's In the Shadow of the Sun as it's fine melodic progressive rock, with some metal edge. The band shows great talent and creativity throughout this work.